ETA Mark Shelton and his assistants give out scarves to eager fans. Photo Credit: George Ouiellette. The story of why and how Mark Shelton made the decision to become an ETA is one of the most touching that I have posted on SIDEBURNS Magazine. Mark, who is from the State of Vermont, is an accomplished ETA with an interesting and extensive bio that I am pleased to share with SIDEBURNS readers. 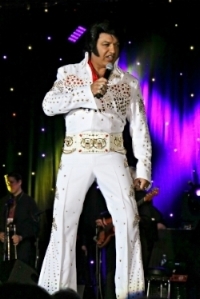 Mark will be competing this coming weekend at the Niagara Falls Elvis Festival, Ontario, Canada. I wish to thank Mark for sending along his bio and photos. Best regards, Carolyn MacArthur. A man of great faith, Mark's motivation to prominently enter the Elvis Tribute Artist world, is led by a deep and powerful conviction. Three days after they were wed, Mark’s bride, Lisa, was diagnosed with stage IV lung cancer—a terminal sentence. The couple have relied on their faith and trust in God to navigate this journey. Mark Shelton at 17 years old performing as Elvis. Photo Credit: Don Whipple. One day, upon this path, Mark asked Lisa what she would like to do in the time the Lord allowed them to share together. Mark offered her vacations, but Lisa stated that she wanted to see Mark sing the music of Elvis like he did in high school. Mark then began working to trim his weight down from over 385 to 215 pounds in about a year and put on the show of a lifetime. The show was a sell out and requests began pouring in for Mark to perform his Elvis tributes in other venues. All the proceeds from the concerts are donated to Lisa’s medical fund. ETA Mark Shelton with his lovely wife, Lisa. ETA Mark Shelton at the Hard Rock Café. Photo Credit: Lucille O'Donnell. Mark Shelton, a dynamic performer with astounding vocal prowess, leaves audiences mesmerized in amazement with his incredible voice that is both strong and diverse. Engaging--with his "star" quality, Mark Shelton effortlessly moves through the 1950s to the 1970s Elvis Presley songs, mirroring the King of Rock n' Roll. He nails every Elvis Presley song of any era with such precision that people sometimes think they are listening to a recording and are left breathless when they discover it is a live performer who is singing. It is truly impressive. ETA Mark Shelton performs for a sold audience. Photo Credit: Brian Newton. Consistently performing to sellout shows with his presentation of Elvis during “THE KING RETURNS” concert tours, Mark Shelton has become an internationally acclaimed Elvis Tribute Artist. Mark Shelton and his highly impressive live band, leave audiences stunned in amazement at the world class quality of the production. Mark's Elvis tribute concerts have a personal touch, since each benefit concert aids his wife in her ongoing battle with the dreaded disease. Mark’s benefit shows have received national attention, and he has been featured on ABC News, CBS Inside Edition, Good Morning America, and many, many more. Mark has also received global accolades, including featured stories in India, Fuji Television Network in Japan, and the Daily Mail in the United Kingdom. Come and see why the world is talking about this not-to-be-missed show! ETA Mark Shelton serenades his wife, Lisa. Photo Credit: Gail Singer. In the entertainment field, Mark Shelton has had an amazing career spanning multi-faceted venues, recording several times in Nashville, Tennessee, and releasing custom projects. Mark has recorded and performed in Canada, on Cruise Ships, in hundreds of churches, schools, auditoriums, at festivals, on live television and radio, and at major music festivals including: Soulfest, the Block Island Music Festival, the M/S Mt. Washington Cruise Ship, the Florida State Fair, Godstock, Jesus is Lord Festival, the Lake Champlain Maritime Festival, Myrtle Beach Bike Week, Palm Beach, Key West, (etc., etc. ), as well as in Montreal, Germany, and the Caribbean. Mark also performed a special tribute to the music of the Rat Pack at the Hilton in Long Beach, California, for Project Cuddle. Mark headed back to Los Angeles to perform once again at the Hilton in February of 2016 at an event hosted by very popular actor, John Stamos, this time doing the music of the “Flower Power’ era. In 2011, Mark sang the National Anthem in front of a crowd of over 37,000 for the Boston Red Sox at Fenway. But it is his captivating tributes to the music, style and spirit of Elvis Presley for which Mark has received international acclaim as one of the best voices and renditions of Elvis hits ever heard. ETA Mark Shelton performing at Lake George, 2017. Photo Credit: Eva Brand. New to the Elvis Tribute Artist competition world, Mark Shelton was awarded the People’s Choice award at the 2017 Reflections of the King, and was runner up in the 2018 28th Annual People’s Choice in Montreal--his first appearance at each event. Mark has been receiving accolades and invites to perform all over the world. He has been selected to receive induction into the International ETA Hall of Fame in Memphis in 2018 due to his humanitarian work, service to his country (Military Police Officer in the United States Army), and for his long history of quality Elvis tribute performances since 1978, and for the global attention and positive reflection he has brought to the memory of the King of Rock and Roll. 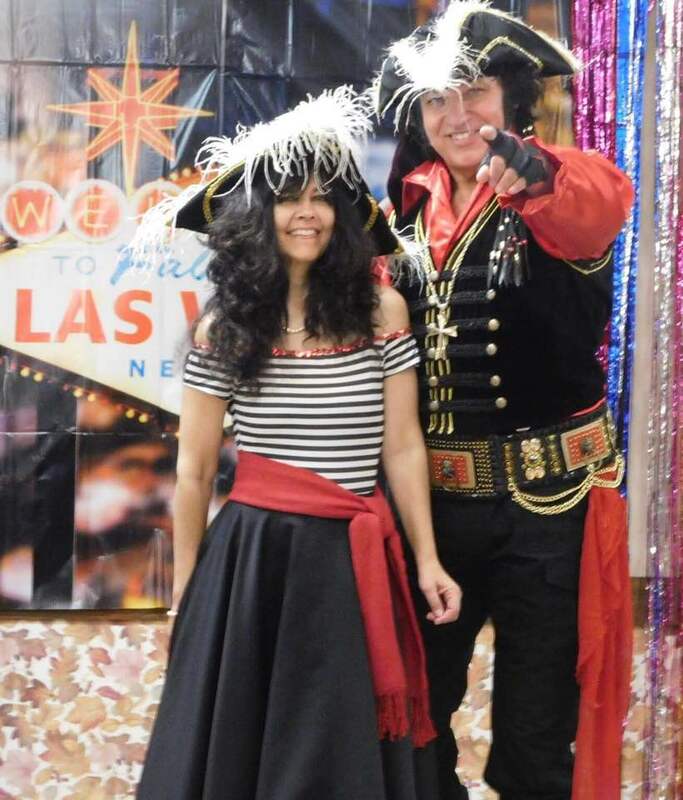 Mark Shelton as "Captain Radical - the Pirate King of Rock and Roll" with his wife, Lisa. Photo provided by M. Shelton. Mark Shelton is a life-long resident of the State of Vermont, living on the border of Canada, 90 minutes from Montreal. He is married to his beautiful wife, Lisa, and the couple have two children, Barry and Johna. Barry is currently on active duty as a Cyber Security Specialist with the United States Air Force, and Johna is pursuing a musical education degree at Gordon College, her mother’s alma mater, in Wenham, Massachusetts. Mark and Lisa each have performed vocally throughout their lives. Mark graduated from Boston University with a Master of Criminal Justice degree. He graduated first in his Class of 2014 with a 4.0 GPA. He received his Bachelors in Communications at Lyndon State College. Mark is a 31 year veteran with the Vermont Department of Corrections, having worked as a Probation and Parole Officer, Corrections Officer. He is currently a training officer for the Agency of Human Services. Prior to his work with the State of Vermont, Mark was a Military Police Officer with the United States Army. He was also commissioned as a Kentucky Colonel in 1998 for humanitarian work. On another interesting note, Mark Shelton has performed as a professional wrestler bringing the character "Archangel" to life. Finally, Mark also performs in many venues as the swashbuckling "Captain Radical - the Pirate King of Rock and Roll" bringing great music, joy and family fun to a great many venues! ETA Mark Shelton. Photo Credit: Lucille O'Donnell. A stunning live performer, Mark Shelton was named 2007 "Best International Christian Male Artist" in the “Toronto Exclusive Magazine” in November of 2007 and described in Christian Music's "Relevant" Magazine, and “Celebrate”, Radio's Internet & Satellite Ministry, as "One of the strongest voices we've ever heard. With powerful lyrics and dynamic presentations, Mark Shelton is anything but your traditional performer." Audiences and venues consistently report that Mark Shelton's performances are considered among the best shows they have ever seen. If Mark Shelton is ever in your area for a concert, sock hop, or children's theater, you should jump at that chance to see him! Never a disappointment, and always amazing, it is a memorable and interactive experience for all involved no matter what adventure or performance he brings to your area.